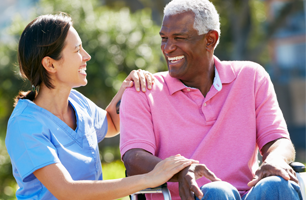 At Home Care Staffing has been providing Medicaid Personal and Respite Care as well as Private Duty to clients in the Richmond area since 1996. We are a family-owned and locally operated business with six locations to better serve our clients. We are certified as a Private Duty and Medicaid home health provider, and we are certified members of the Virginia Association of Home Care and the Virginia Association of Personal Care Providers. Our certified home health aides are fully screened via extensive background checks and are bonded and insured. Our qualified specialists can assist you or your loved one with a number of companion care services and solutions. We can assist with daily tasks to make everyday life easier or we can provide round-the-clock care. We can help determine what level of care is needed and whether our advanced care services are required to ensure your optimal health and well-being. We are always looking to recruit CNA's and PCA's to join our growing team of healthcare professionals at our six locations. Find out more about our employment opportunities and let us be part of your healthcare career! © Copyright 2018 At Home Care Staffing. All right reserved.